First of all, MIRAGE definitely does not fit into my preferred genre of reading. Fantasy just never really grabs my attention. I will say that MIRAGE has an extremely interesting concept but falls short on many levels. The fact that it’s a work of fantasy cannot be counted against it since this is mostly my fault for not being a fan of magical worlds filled with powerful sorcerers, hordes of scary monsters, heroes who inevitably rise above them and characters and locations with names that have too many vowels in them. That’s just me. No, MIRAGE has enough other things going for it that made it difficult to fully grasp. Like I said, the concept was very intriguing: an alternate world, Nascentia, made up entirely of characters from stories and legends. It’s a world inhabited by nosferatu, leprechauns and the tiger from The Jungle Book. Even Santa Claus is kicking around in Nascentia which is kind of cool. It’s a lengthy and admirable first work by a new author and there are plenty of moments where I stopped and thought about how wonderful a description within a particular sentence was. But then there’s everything else about it. Our hero, Kellen, arrives in Nascentia and is (of course) sent on a perilous mission of dire consequence with the hottest girl in town. Now because Kellen is the proverbial fish out of water, our tour guide (Mirage, for whom the book is named after) explains the lay of the land to him. What follows is 400+ pages of serious info dump. Mirage explains everything to Kellen, and I mean everything. And she doesn’t skip on the detail either. I admire the author for having crafted such a richly detailed world, but the story stops from being a straightforward quest and it reads more like a Nascentia guidebook. At times I forgot what the characters were supposed to be doing, having been bogged down with so much explanatory dialogue after every corner they turn. MIRAGE includes an appendices at the end of the novel, so much of the information within the story can actually be found again at the end. As such, I feel as though I could have been reading more actual story along the way. The editing in the book borders on appalling, with so much arbitrary capitalization of words as well as word duplication, typos, and ignorant document settings like paragraph indentation and extra spaces between sentences within paragraphs. I also prefer reading novels with a “justified” typeset, rather than the harder to read left-aligned one withing these pages. Will I read Volume Two of The Book of Nascentia (it’s fantasy, so of course there’s more volumes to come!)? Probably not. But if you like richly detailed worlds of fantasy that don’t ever have to end then you should check out MIRAGE, and help support self-published works! 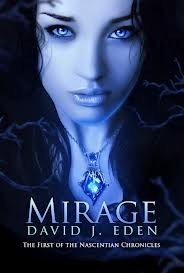 This entry was posted in Book Reviews and tagged Book Reviews, David J. Eden, Fiction. Bookmark the permalink. Hey Ryan. Wanted to thank you for your review of it. While being a little harsh, your points are very much valid. Perhaps MIRAGE needs a bit of an overhaul. However, it was my first work and I had no editor to help me along my travels. Book 2 will certainly be more story-driven and once its completed, maybe I’ll go back and take care of MIRAGE’s setbacks. Hi David! I don’t know if I planned on coming across as “harsh”, I just wanted to be honest. Fantasy has never been my thing though, so I’m maybe at fault for tackling the book with preconceived notions. But please, keep on writing! Your ideas here are awesome and I have no doubt that there’s a great audience for your work out there. And I appreciate you popping by my site and commenting! I appreciate the feedback, old friend, I really do. I’ve already started skimming over the book and making notes for a revamp.